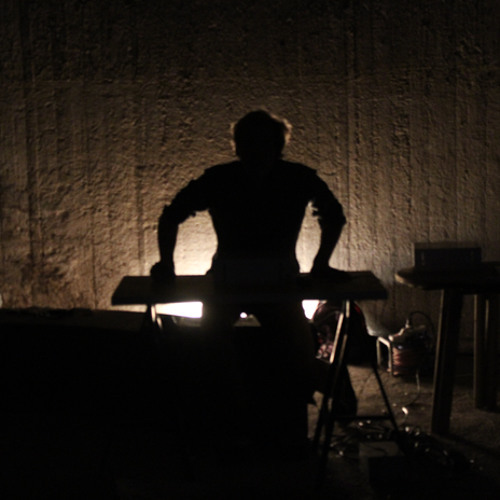 Klanksporen explores the acoustics of resonating objects and spaces through site-specific performances. Additionally, Mischa Daams performs Klanksporen alongside multi-instrumentalist Martijn Barendregt who plays Didgeridoo. www.mischadaams.nl Using self-made instrumentation Mischa Daams performs sonic landscapes by making various materials -like wooden plates and steel boxes- vibrate. Drawing gestural paths over these physical surfaces, specific acoustic characteristics are highlighted. Spatial characteristics are emphasized along their reverberant acoustics. Specific architectural spaces are selected for their sound quality, as they become a carrier for sound. The way in which the acoustics of a space amplifies, morphs and sustains the source sound plays an important role in the performance. Ultimately the taken trajectories leave trails, both physically on the surface as spatially in terms of its sonic tail in the form of an echo. The interferences and patterns between all resonating matter~energy become equally important.